If you're selling or scrapping your car and want to keep your private registration, you'll first need to remove it from the car. Should I Remove My Plate? If you want to keep the registration that is currently on your car - to transfer it to another vehicle, or to simply hold onto as a certificate until you decide what to do with it - then the answer is yes. When a car is scrapped, unless the registration is first removed, the number plate will be lost along with the vehicle. There's also then no hope of the number plate ever being issued again. The DVLA do not re-issue plates that have previously been on vehicles. If you are selling your car, then the V5C (log book) is essentially the proof that you own the registration. If you do not first remove the number plate before transfering the ownership of the car to someone else, then they will become the owner of the registration along with the vehicle. If you have no interest in keeping the registration, then you don't have to do anything and can let the number plate go with the vehicle. However, it may be first worth getting a free valuation for your plate in case you're sitting on something worth more than you expect! Back in the early 1900's, before private plates were seen as desirable items, countless registrations that today would be worth tens - if not hundreds - of thousands of pounds were simply scrapped along with the vehicles they were on. Your plate might not fetch quite those figures, but if it contains certain numbers, initials or matches a name or word, it may make it worthwhile saving it from simply being lost forever. When Should I Remove My Private Number Plate? You should do this before you dispose of the vehicle. As mentioned above, if the registration is still showing on the V5C (log book) for the vehicle when it leaves your possession, you've also lost possession of the number plate. If you are able to remove the registration using the DVLA's online service to remove a number plate, then this can be done instantly. A new/replacement V5C will be sent to you - which can take 4 to 6 weeks to arrive. If you need to perform the removal by post, then you need to allow around 2 weeks for your request to be processed, and then the 4 to 6 weeks for the replacement V5C to arrive. How Do I Remove My Number Plate? The quickest means is to do this online. If you want to transfer the number plate straight to another vehicle, you'll need information from the V5C's for both vehicles; fill out the relevant details the DVLA ask for, and the transfer will take place. If you're not ready to put the plate onto another vehicle just yet, you can move the registration onto a V778 retention certificate - which is valid for 10 years - and can be used to put it onto a vehicle at some future point (or perpetually renewed). If you're unable to use the online service, you'll need to send your request - including a completed V317 transfer form, and the V5C for the car that has the number plate you want to remove - direct to the DVLA in the post. Note that to take part in a transfer like this, all involved vehicles must be taxed and tested, and the V5C shouldn't highlight the registration as one that cannot be transfered (usually there's a message along the lines of 'Non-transferable Registration Mark' stamped on the log book to warn you if this is the case). What Happens After I Remove My Number Plate? The DVLA will send you a new V5C in the post. Because a car cannot be on the road without a registration, this will show the random replacement reg that the DVLA have issued you. If the plate you are removing is a private plate, then it is often the case that the original registration the vehicle had will be returned to it. 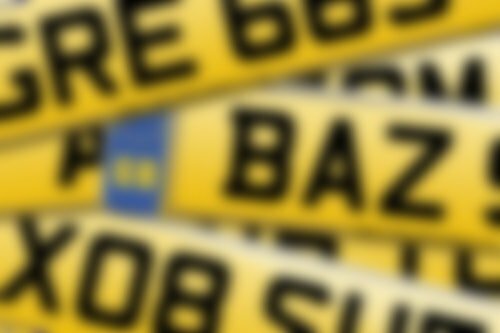 Once you know this reg, you can order some acrylic number plates to put on the vehicle, inform your insurer, and then proceed to scrap, sell or generally pass ownership of the vehicle on, safe in the knowlegde the reg has been saved. If you transfered the registration straight to another vehicle, and you did this online, you'll have been told the transfer was complete and should already now be displaying the plate you salvaged. If you had to wait for the V5C in the post, you'll now know the transfer went OK and can put the acrylic plates on your car, and inform your insurer of the change. If you weren't porting this number plate to another vehicle, but now have it on a V778 retention certificate, you don't have to perform any additional steps. If your goal is to eventually put the registration onto a vehicle, then once you are ready you can follow this guide to assign a number plate certificate to a vehicle.